It’s time to go all traditional, and all, and look back at my hobby year for 2018! It’s been quite the year, I have to say! Despite some monumental events, including getting married in September, I’m glad to have been able to keep going with hobby stuff. I’ve definitely built more than I’ve painted, but of course that is always the case, really! Starting really quite early, I built this beautiful beast 12 months ago, though he sadly still languishes in the same state after all this time! I really need to get a move on and make some decisions as regards my Tyranids. I’ve done quite well with the Great Reanimation of my Necrons, getting a good number of units painted up, including the beautiful new Cryptek model. I’ve still got a way to go with the army, for sure, but having only had one unit of Immortals painted in the new Thokt dynasty scheme back in 2017, this year has seen a real surge! Splendid stuff. 2018 saw me start a couple of armies, most notably the Tau. I’m in a bit of a weird position with this army now, as I feel like it was a bit of a distraction for me while I was waiting for the Dark Eldar codex. I did enjoy building up the models, for sure, and I think there is still a place for them in my collection, but probably nowhere near as many models as I have ended up with! So I’m going to be looking through both the Tau and Tyranid collections in an effort to thin out some of the dead wood, so to speak, and make sure I only keep enough models for small forces of each that I want to actually play with. Famous last words, probably, but still! I’ve made significant strides with yet another xenos force, the Genestealer Cults! Being a horde army, though, I’m still nowhere near to having the required number of models for the force, but I think I’m suitably inspired to keep going. Slow and steady, and all that! In terms of smaller scale games, I’ve painted up some Van Saar gangers for Necromunda, and have started work on the Elucidian Starstriders, but this is where things get interesting, as I started looking back into fantasy after all these years, with the new iteration of Warhammer Underworlds. It was a lot of fun, and it has led to getting myself into a very ghostly mess! The Nighthaunt models are beautiful, but I’m also vacillating between Idoneth Deepkin and Chaos Beastmen in creating my first army for the new Age of Sigmar. 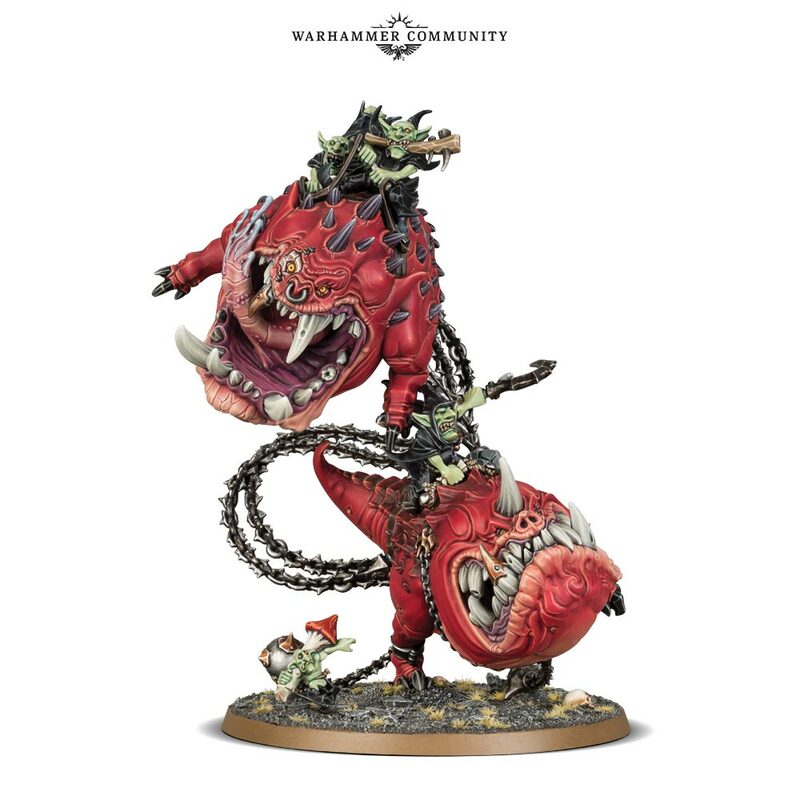 It’s definitely going to be one of them, though I’ll most likely also be picking up some of these new grots models in time. I do enjoy squigs! Finally, I’ve been working on some of the Chaos Cultists that I’ve had hanging about for years, inspired by the weird and wonderful underbelly of 40k that we got to glimpse in Blackstone Fortress! This game was quite the boon to me, as it inspired not only the Cultists but also work on the Electro-Priests that had similarly been hanging about for years – all in all, then, it was very much well-received! I wonder what 2019 will see for my hobby! Hopefully some of those models that I’ve built up over the last year will see themselves finished!! There is a nice mix, I feel, between some of the more wide-ranging stuff with the Grey Knights and the Nighthaunt, and more focused goals for things like the Neophytes and Doomsday Ark. There is bound to be more that distracts me as the year goes on, of course – I’m looking forward to the Genestealer Cults getting their bikers, for sure! Whether Inquisitors come out for Kill Team is anyone’s guess, though I’m fairly positive I’ll go heavily into this one! I’m going to be writing up my Hobby Progress blogs on the last day of each month as 2019 goes on, so it should keep me motivated to stay on track. Exciting times ahead, at any rate!! As you probably know, if you’ve been keeping up with my blog for any amount of time, I’m a big fan of Warhammer 40k, and really enjoy what’s been happening with all the new stuff right now. But I feel a bit like there’s almost too much coming at me right now, that I can barely keep up with it all and contain my excitement! Let’s recap, first of all. 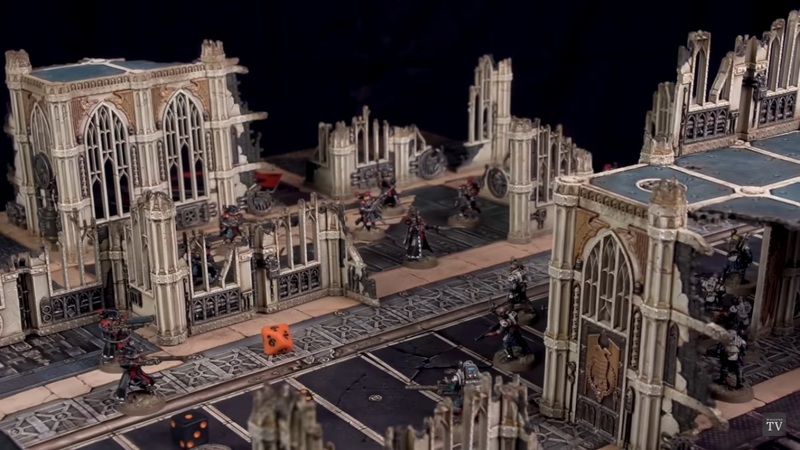 Kill Team was announced at the GAMA Trade Show, as an updated version of the skirmish game, and I was extremely excited. I love the idea of small-scale games, and I’m really intrigued as to what they mean with making it a fully supported and distinct game system. Should be a lot of fun, not least because it will also be coming along with more terrain, which is always good! Overall, very much looking forward to getting some of this in my life! At the same time, we also had House Van Saar announced as the fourth gang coming out for Necromunda, and I was also incredibly excited by the look of these guys. I do love the biker aesthetic of House Orlock, as I’ve mentioned on this blog already, but there’s something about Van Saar that I can’t quite put my finger on. What I do know is, I’m going to be getting these chaps, too! I think I’m pretty much dedicated to following Necromunda for all of the new gangs, as I’m just really in love with the feel and the look of them all. But yeah, there’s something I can’t quite put my finger on about this gang that is making me really intrigued to try them out. So that’s another resounding success! While they were also announced at GAMA, we had to wait until Adepticon this week for the reveal of the next faction for Age of Sigmar, the Idoneth Deepkin. And my goodness me, what a reveal it was! This video, and stills from it, seemed to take over my facebook feed for 24 hours straight, it was quite amazing! While they’re not the Fishmen we’ve been waiting for all these years, the Deepkin take as their basis the Black Ark Corsairs subfaction of Dark Elves from the World-That-Was, and they really go to town with it! GW’s miniatures have improved so dramatically since the Corsairs were a thing, and it really shows with these guys. But it won’t stop me getting some of these Deepkin to convert for my Dark Eldar…! I’m still pretty excited for these guys, anyway! Of course, lots of other tidbits have come out of Adepticon, such as the next three Codexes after Drukhari (rumoured to be out on 7 or 14 April), news of some huge Knight that mocks the idea of this being a miniatures game, an Age of Sigmar CCG, and of course, the confirmation that plastic Sisters of Battle will be coming out in 2019. Of course, I’ve been feeling pretty burnt-out on the Sisters rumours for quite some time now, so even despite this news, I’ll still believe it when I see it. However, it’s nice to see the community feedback finally taken seriously on this point! And no doubt, when they come out, I’ll want an army of them like most other people! Along with all of this, we have the Forgebane game coming out tomorrow, and the Necron Codex is due over the Easter weekend. I’ve already been excitedly starting a Tau army, which is once more vying with my Necrons for my attention. To say nothing of adding yet more miniatures to my Dark Eldar, which I’ll doubtless be in the mood for in another couple of weeks when their Codex comes out! All of this stuff has got me feeling a little bit like I’m on some kind of hobby treadmill, and I’m in actual danger of falling off! I’m sure there’s plenty more on the agenda that I’m just not thinking about right now! First-world problems, for sure, but I think I’m in danger of getting into some kind of hobby overload once more, and I think I need to take a step away and almost move all the half-complete projects to the side while I concentrate on just one! I had a real issue when trying to paint the Genestealer Cultists that I discussed in my Tau blog here, in that I felt like I was out of practice with painting in general. I still haven’t yet made any concerted effort to remedy this, but until I do, I’m not feeling confident enough to get moving on things like the Deathwatch, Thousand Sons, or Necromunda minis. I need to focus on a much smaller array of stuff, and in fact I think I need to actually fully paint up a single unit to get my head back in the game, as it were! Something that is increasingly difficult with all of this wonderful new stuff coming out left and right! But looking at it from the opposite side: what a glorious time to be in this hobby! !